For networking builders, network switch is an essential component in their networking building plan. In a network deployment, switch channels incoming data from any of multiple input ports to the specific output port that will take the data toward its intended destination. Besides, to achieve high performance level, there are different types of switches in networking. This article will introduce different types of switches in networking to help you choose a suitable one for your networking. Local area network switches or LAN switches are usually used to connect points on a company’s internal LAN. It is also known as a data switch or an Ethernet switch. It blocks the overlap of data packets running through a network by the economical allocation of bandwidth. The LAN switch delivers the transmitted data packet before directing it to its planned receiver. These types of switches reduce network congestion or bottlenecks by distributing a package of data only to its intended recipient. Compared to unmanaged switches, the advantage of managed switches is that they can be customized to enhance the functionality of a certain network. They offer some features like QoS (Quality of Service), Simple Network Management Protocol (SNMP) and so on. These types of switches in networking can support a range of advanced features designed to be controlled by a professional administrator. In addition, there is smart switch, a type of managed switch. It has some features that managed switch has, but are more limited. Smart network switch is usually used for the networking devices such as VLANs. Stackable switches provide a way to simplify and increase the availability of the network. For example, instead of configuring, managing, and troubleshooting eight 48-port switches individually, you can manage all eight like a single unit using a stackable Switches. With a true stackable switch, those eight switches (total 384 ports) function as a single switch—there is a single SNMP/RMON agent, single Spanning Tree domain, single CLI or Web interface. There are valuable operational advantages to use these types of switches in networking, such as you can create link aggregation groups spanning across multiple units in the stack, port mirror traffic from one unit in the stack to another, or setup ACLs/QoS spanning all the units. This article briefly introduces five types of switches in networking: LAN switch, unmanaged switch, managed switch, PoE switch and stackable switch. All of them have their own characteristics and are used in different network deployment. I hope you can have a better understanding on them after reading the article. Related Article: Powering PoE Switch From A PoE Switch: Is It Possible? When it comes to network switch, we usually ask about the port type on the switch and the number of port, such as twenty-four 10/100/1000 Mbps ports and four SFP+ ports. If you have used managed switch in your network deployment, you must have heard about uplink port or normal port. How much do you know about them? Is there any difference between them? This article will guide you to learn about uplink port vs. normal port on switch. The uplink port on switch is used to connect a device or smaller local network to a larger network, or connect to the next “higher” device in the topology. For example, edge switch connects “up” to distribution layer managed switch. Also in computer network, hub, unmanaged switch and router typically designate one Ethernet port as the uplink port. And it may be labeled WAN or Internet instead of uplink. This type of port simplify connects different types of Ethernet devices to each other, such as when linking a local home network to a modem and the Internet. While normal port on switch is used to connect end user PC or server and all. 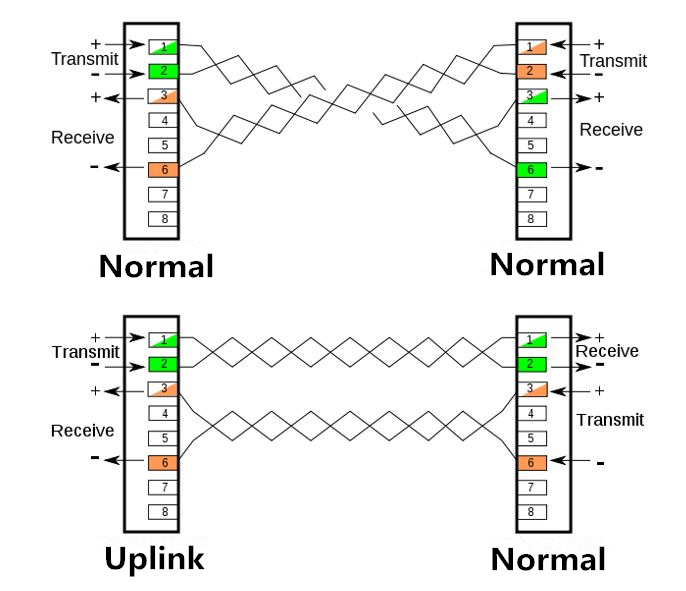 In most cases, uplink ports have more bandwidth as compared to normal ports as they aggregate traffic between different layers. Each Ethernet interface has two transmit pins and two receive pins. To achieve the link connection, the transmit pins at one end of network cable have to be connected to the receive pins at the other end. An uplink port does not crossover the transmit and receive pins, but a regular port does. Therefore, when two network switches are connected together with a straight-through cable, then one end must be uplink port and one end must be normal port. If a crossover cable is used to connect them, then the ports at both ends must be the same kind of port. Here is a figure for you to have a better understanding of this. Some older network equipment specially configured a normal port next to the uplink port and linked the two together as a pair. Specifically, the hardware logic of these products supported connections to either the uplink port, or the normal shared port, but not both. Connecting devices to both ports of a shared port device stops the unit from functioning properly. Nowadays, many network equipment offer a dual-purpose port which can function either as an uplink or a normal port depending on the type of device connected to it. In fact, uplink port can serve as normal port. Therefore, there are no big differences between them. The only difference is that uplink port is connected to higher layer network device to aggregate the bandwidth and must be connected to the normal port on another network device. I hope after reading this article, you can be clear on uplink port vs. normal port on switch. 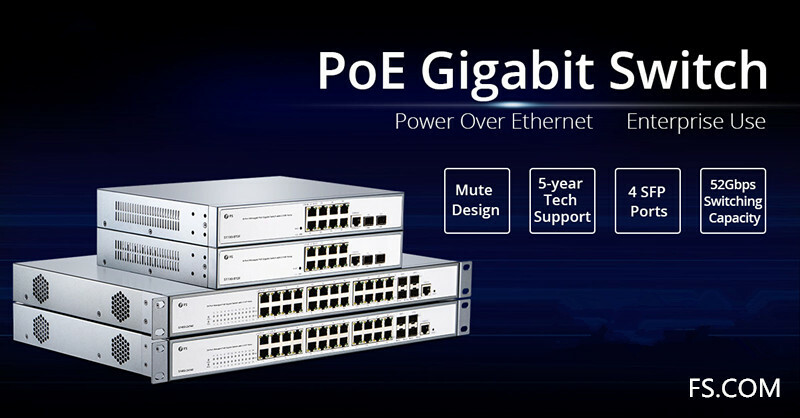 From the above 8 port PoE switch recommendations, we can clearly see that all these five switch have similarities and differences. For example, all of them support PoE function, but UniFi US-8-150W, D-Link DGS-1210-10P and FS S1130-8T2F support both PoE and PoE+ standard; all of them have 8 RJ45 port and 2 SFP ports, but their maximum power consumption are different. Which one to choose really depends on your specific requirements. If you need to use PoE devices with larger power consumption, UniFi US-8-150W and FS S1130-8T2F switch are good options; if your budget is tight, you can choose D-Link DGS-1210-10P, TP-Link TL-SG2210P and FS S1130-8T2F switch according to the above 8 port PoE switch. 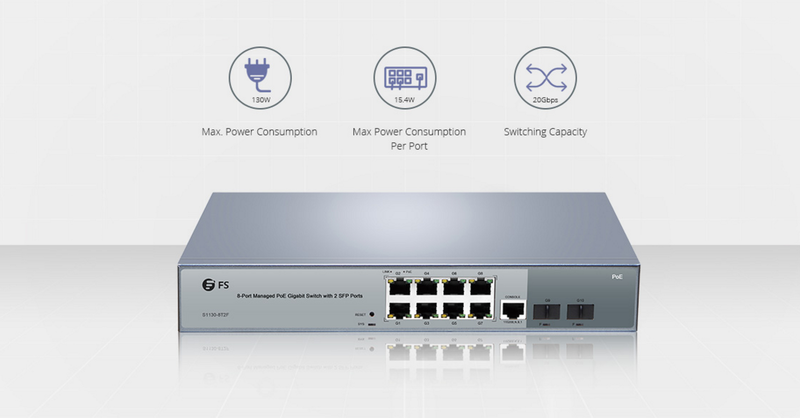 From the comparison, we can conclude that FS S1130-8T2F switch is a cost-effective solution which can supply higher power at lower price. I hope this article—8 port PoE switch recommendations will help you choose a suitable 8 port PoE switch for your network deployment.